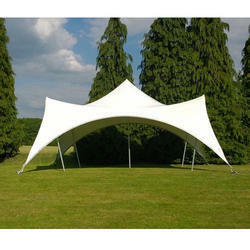 Leading Manufacturer of marquees tent from Valsad. This tent is a single roof tent consisting of a single room fitted with two open able doors and eight windows. The windows are fitted with mosquito nets and curtains. The tent stands on two standing vertical poles supported by one horizontal ridge pole. Meanwhile, the walls are supported by standing poles. The doors have open able curtain which can be either rolled up or can be extended outside the tent and supported on two door poles to make a small porch. These doors also have interlocking facilities to securely close with the tent. Roof top ventilators and cloth combinations are provided as per client's request.